So you agonized over your personal Word of the Year (WOTY) and finally arrived at the perfect mantra, focus, challenge, etc… but now what? I suggest you find a way to VISUALIZE your Word in a way that tangibly brings it (or it’s meaning) to mind every day. In my last post, we explored ways to perceive our WOTY. For me, my Word “Advocate” acts as a scale to weigh my thoughts, options, and circumstances. 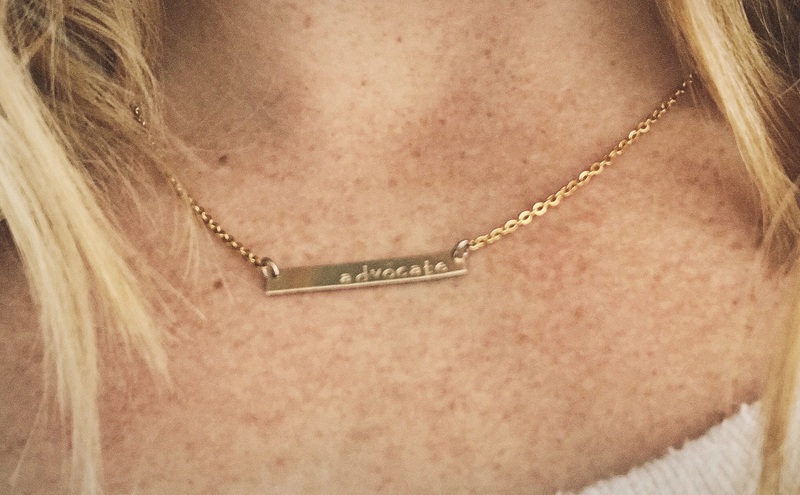 Having my word printed on this gorgeous gold bar necklace has forced me to acknowledge it constantly. It is so pretty, its purpose is hard to ignore. Every time I bend over (which is a lot with little kids running around!) this necklace falls down over my chin. At first it was annoying during every downward dog in yoga class; however, soon I began spending these moments praying for my co-gym mates or my little kiddos. And sometimes the bright gold catches the light perfectly in my bathroom mirror, reminding me to attend to my appearance in a way to advocate for the gospel (think: Image Bearer confident in Christ). I love wearing my Word so much, I want to share a similar necklace with one of you! 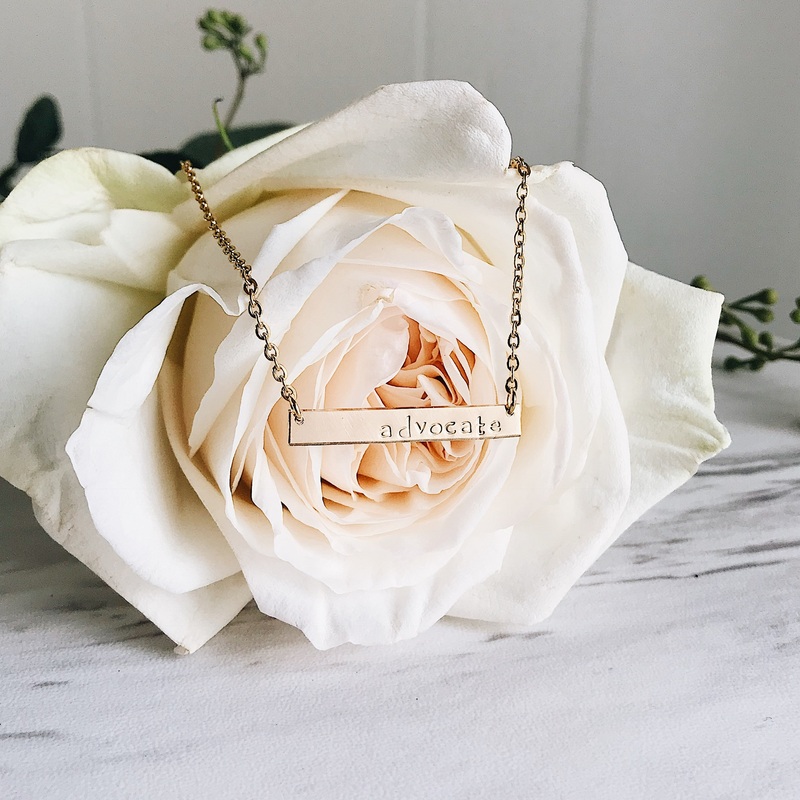 Enter here then scroll to the bottom of this post for more details on my Word of the Year Necklace Giveaway (Giveaway Now Closed 1/17/18). Full disclosure: I have broken an unspoken rule of the personal WOTY: I have more than one word! My sisters and I set up a canvas-painting party with our mom after Christmas. I was bound and determined to somehow paint a representation of “Advocate.” As paint splashed from my brush, unexpected vulnerable fears leaked from my soul. What came out instead of “advocate” was a raw but imperative second word for the coming year: F L O W.
F L O W helps me be bendy, fluid, and moldable. While pushing into the intentionality of gospel advocacy is a powerful display of obedience to God, so is an awareness of the Holy Spirit’s guidance and ease-of-burden in the process. 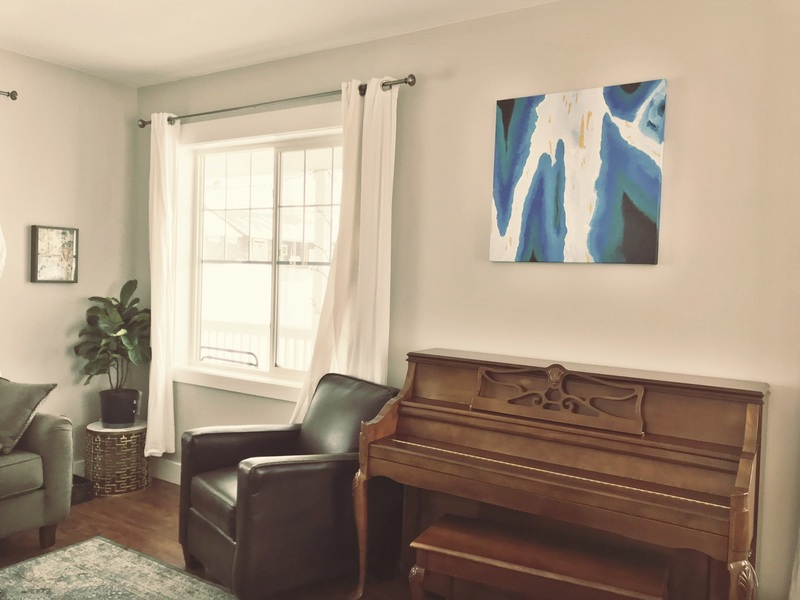 My F L O W canvas reminds me of all these things from its perch above my piano, in the one quiet room of the house where I study God’s Word and practice yoga. In the year of “Live Alive,” I compiled a playlist on Spotify that represented our goal to live boldly, fully, and gratefully throughout 2017. 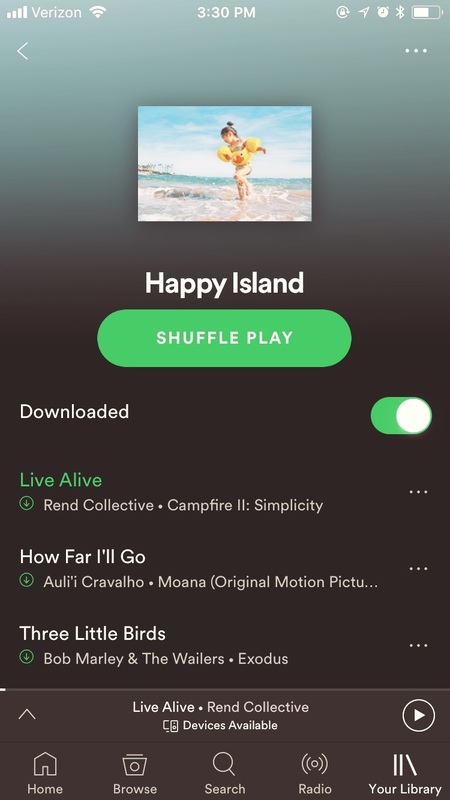 Sounding off with Rend Collective’s Live Alive, my Happy Island playlist is still a family favorite. Inviting our kids to add their “live alive” songs added to the joy and ownership for everyone in our family. You will never hear a more eclectic mix of Bob Marley, Chris Tomlin, Disney soundtracks, and James Brown (I Feel Good, I knew that I would, now!). Check it out here. 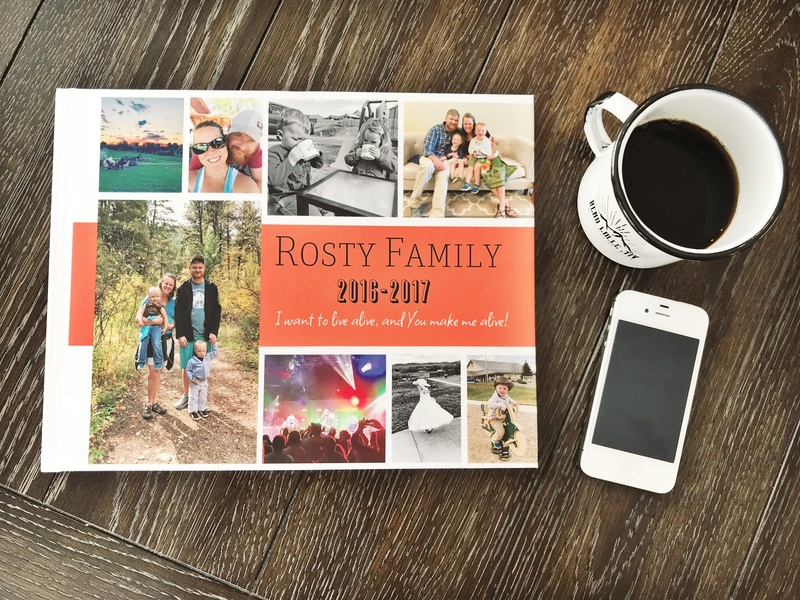 One of my FAVORITE things I have ever done for our family was build an annual photo album on Shutterfly. This brings me to my second confession: I do not pick my word of the year in January. We usually pick it in the summertime before the school year, when we are tangibly faced with seasonal life changes. Our family year books represent an entire school year, beginning with the summertime beforehand. I organize the photos throughout the year and order the book on Cyber Monday. Our kids look forward to opening their Christmas Eve box and seeing the former year in photos. This year, I added our “Live Alive” WOTY to the front of the book, along with photographed moments in which we were intentional to do some abundant living. 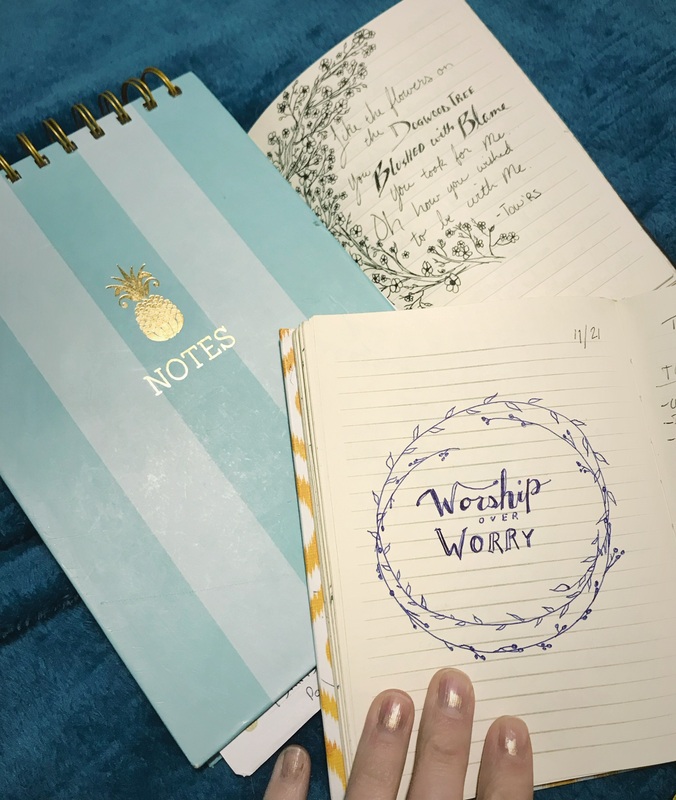 Art journaling is a somewhat more official and sophistic form of doodling important things, either in an actual journal, or pretty much anywhere you have space to create. One year, my word of the year was Flourish. I represented this word with leafy doodles and flowering patterns of ink in my journals (I end up with several year). 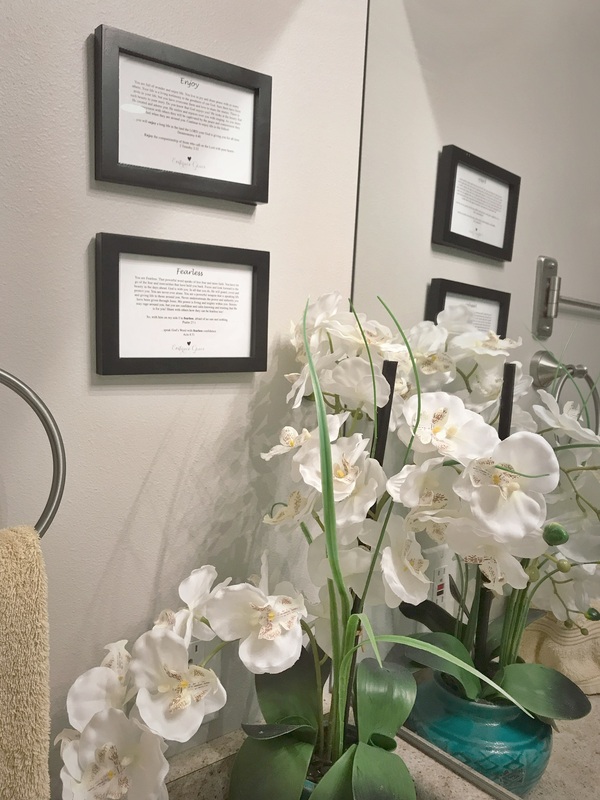 In fact, these reminders to Flourish ended up everywhere: random sticky notes, to-do lists, my daily journal, sermon notes, white boards, grocery lists and even a hand-painted canvas. This growing collage of encouragement throughout my home kept me focused throughout the year. For 2 years now, my husband and I have attended a small prayer banquet for our local crisis pregnancy center ministry. At the end of the banquet, the staff gives each attendee a blank sealed envelope with a specific Word inside. These words have been powerful for me. Last year, my Word was World Changer. The accompanying verses gave me courage to pursue some writing and speaking opportunities I was wavering on. Invigorated, I immediately framed both Shane’s word and mine and hung them next to our bathroom mirror. This year, my word was Enjoy. At first, I balked at this card telling me to enjoy the year ahead. Excuse me, I think this card was for someone else; I am Becky Rosty! Enjoying life is not something I need reminded of. So I avoided putting my new word in the frame for months! This week as I contemplated this blog post, I realized I really do need the reminder to enjoy. 2018 is the now-or-never year to finish up some precious life projects. Pressing in to finish strong is not always fun, or glamorous. If I am going to be the aforementioned world-changer, I am going to need to enjoy things that bore me, things that scare me. Or I will probably just not do them. And some things are too important to let go. 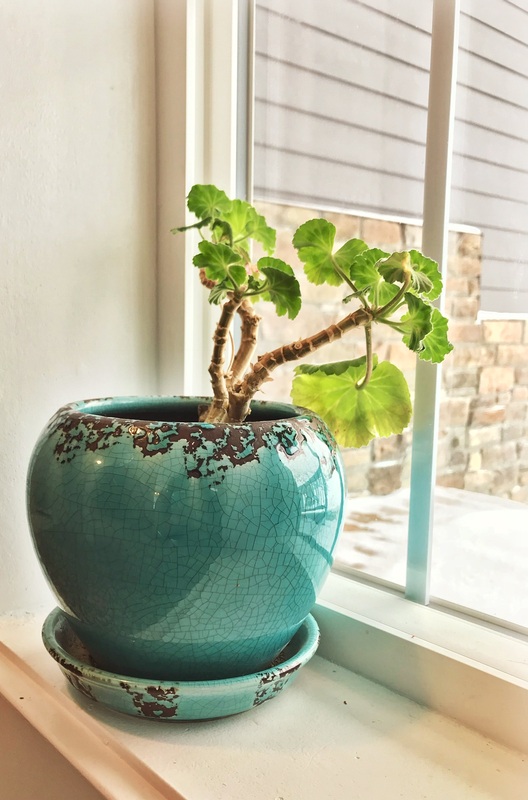 In 2016, my WOTY Flourish also prompted me to give a potted plant center stage in my home. The poor thing needed pruning this year, which is incredibly profound when you think of how that applies to my WOTY. Maybe, in order to keep flourishing in 2018, I need a little pruning too? Perhaps you have a similar Word this year? Find room in your budget to buy a bouquet of flowers each month to remind you to Bloom. Trying to stay present? Grab an inspiring daily desk calendar to keep your focus on the now. Those with Simplify in mind might display a crisp white bowl on their table; make it the family goal to keep the bowl empty, both literally and figuratively. Congratulations April Rogers for winning a personalized WOTY necklace from Joy in the Morning Designs!!! The New Year is still new, my friends! If you are still contemplating why you should choose a Word of the Year, I have some ideas for you. Here are 5 ways a word can positively influence your life in 2018! This word is probably my favorite Word of the Year (WOTY) so far. For our family, it means we never stop looking for ways to make the good news of Jesus’ love famous to the people around us. I had this beautiful necklace made to daily remind me of my commitment to gospel-advocacy. I am so moved by this piece of jewelry that I just have to share it with one of you! Joy In the Morning has partnered with me at Campfire Grace for this exciting opportunity. She has reserved a similar necklace for you to commemorate your own Word of the Year! This stunning accessory is 14kt gold, valued at $56! To enter, add your name and email to the form below, then scroll through all the beautiful designs over at Joy in the Morning. GIVEAWAY CLOSED 1/17/18. Congratulations to April Rogers! A few years ago, I traded New Years goals for a Word of the Year. Goals felt harsh and bossy. Failure to finish felt crippling. By picking a WOTY, I traded fear of coming up short for confidence of going in a helpful direction. I think of it more as a rudder to my ship than a destination I must reach. This word steers me gently regardless of circumstances: whether I face choppy waters ahead or a steady breeze to push me along this year. The year of 2017 was filled with moments that left me overjoyed! It also hollowed out my soul with immense sorrow. And yet, my Word helped me navigate each season. My Word of the year was “Live Alive.” In the bubbling laughter of the twins turning 3, I enjoyed the gift of life we had been given. Through the agonizing heart-break of lossed lives and world chaos, I stopped taking for granted this privilege of life lived fully. Each change of 2017, I asked, how can I fully live alive in the midst of this? How our circumstances affect us is largely how we view them. In 2016, my word was Flourish. 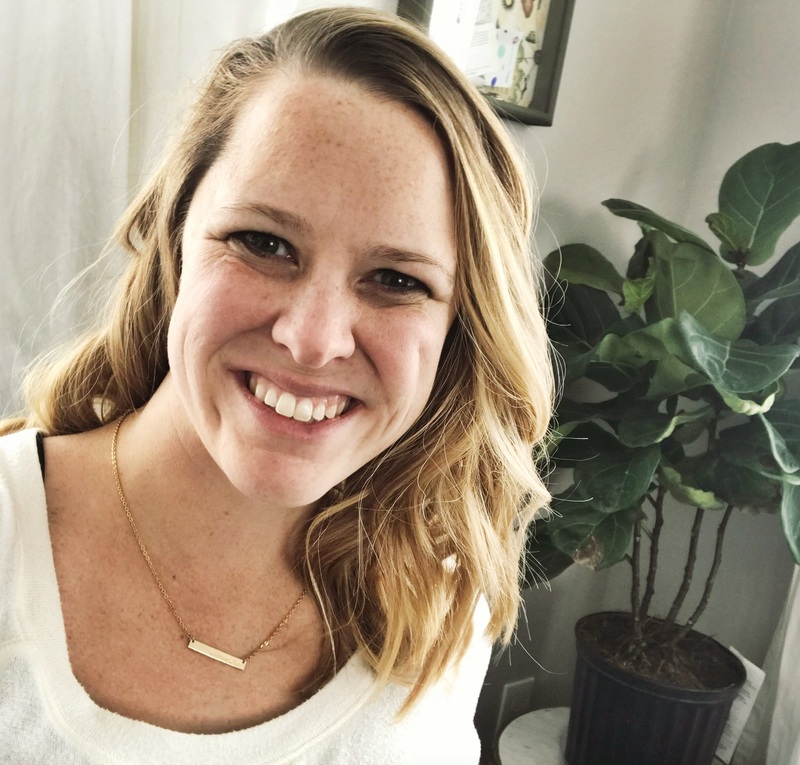 When my twins were potty training, I kept my eyes open for how I was still flourishing in the frustration of accidents and laundry and lots of tears. How could you use a specific Word to filter how you see your year? Pick a word like “Giggle” and you might just laugh off the drama in the office. Adopt “Hallelujah” as your mantra, and notice every event as a reason to give praise to God! I want my goals, my word, my ambitions to work for me, not the other way around. It is too easy for me to become a slave to what I want to fix in my life. Instead, the intentional WOTY will work for me. As a Butler, my Word will remind me to focus on the best things. It will usher in my favorite thoughts first thing in the morning. It will open the front door of my mind only to desirable guests like encouraging thoughts and creativity. It will promptly shoo away lies and discouragement that ask to take residence in my thinking. For many of us, 2018 is already intimidating us with the wide open field of opportunities. Soon-to-be-graduates, recent empty-nesters, and everyone in between are facing lots of decisions this year. Why not pick a Word that could filter each option that comes our way? We get flyers in my mailbox for another kids’ activity. Our Facebook notifications panel is full of invites to support one friend or another in their home-based business party. Our churches are asking for volunteers to lead home based small groups. Our coworkers chatty activity in the break room beckon us to join in gossip. Our mirrors and scales offer the options to self-loathe or keep living fully. As I already mentioned, my word for 2018 is Advocate. My husband and I prayerfully discovered it together. We can easily filter out (i.e. : say no to) any option that does not help us to advocate for the hope of the gospel among those who live in darkness. The Bible describes an Ebenezer was a monument or visual reminder of God’s faithfulness to His people. Last year, our word “Live Alive” was in many ways an Ebenezer to God’s care for us through some difficult times. God helped us keep living. God helped us keep thriving! And we could count on Him to do so continually. Why not pick a word that represents God’s relentless love for you? This word will serve as a rudder, a butler, and an Ebenezer all year long. WOTY suggestions that serve as ebenezers: Relentless, Unconditional, Big Love! The winner will be chosen on Wednesday, January 17, 2018. We will let you know on all online platforms (email, IG, FB, etc.) who the winner is. We can only ship to residents of continental USA. If you are outside the continental states and still want to enter, we may ask you to help cover shipping costs.